White chocolate covered fruit, cake, cookies, crackers or chips, the possibilities are endless! Heat heavy cream, liqueur and chocolate in a 1-quart heavy saucepan over low heat until the mixture is melted and smooth, stirring occasionally. Add more cream if fondue is too thick. 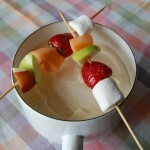 Pour the mixture into a fondue pot or slow cooker over low heat. Garnish with orange zest, if desired. Serve warm with suggested dippers.